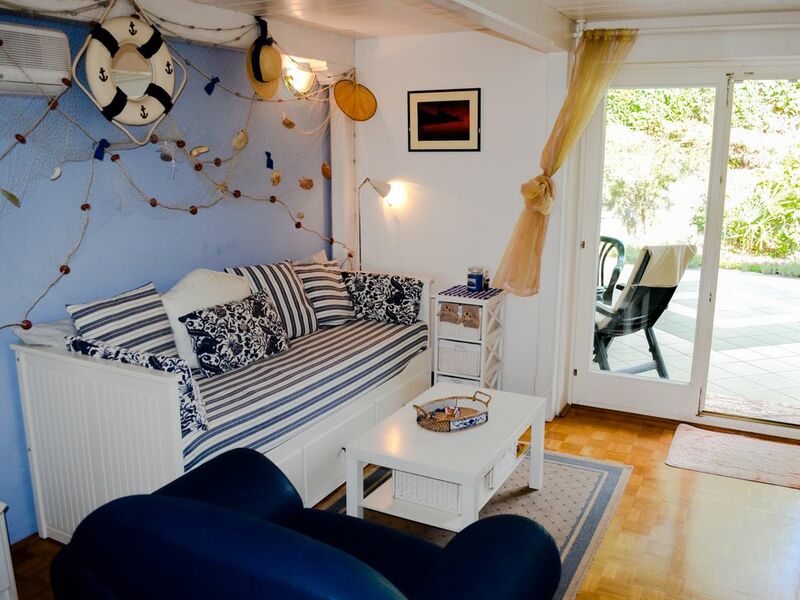 Our seaside apartment with a beautiful private garden is a perfect place for your relaxing holiday. The interior areas have 50m² and are all interconnected to give a feeling of a warm home. Ground floor has a living room with a comfortable lounge area, separated with a bar from the dining area and a small kitchen. The stairs lead to the gallery on the first floor where bedroom with double and single bed is situated. The living room has an exit to a big covered terrace, which continues to its own quiet and fenced Mediterranean garden (40m²) with a summer kitchen and barbecue. Apartment has a bedroom on the gallery with one double bed and one single bed. Additionally, there is a bed in the living room, which can be extended into a double bed, or folded into a lounge sofa. All the linen is provided. Apartment is fully equipped with air-condition (2 units), big-screen satellite TV with radio and stereo system and another TV in the bedroom. Bathroom is equipped with shower, sink, toilet and washing machine. Towels are provided. Hot water is supplied by internal heater. Kitchen is equipped with cooker, dishwasher and refrigerator, basic utensils, dishes, tableware and gadgets. There is a dining area inside, and another one outside on the terrace with a summer kitchen and barbecue. Apartment is in a quiet area with no cars. The private enclosed parking is just few steps away, and it is free to use for our guests. The house is positioned in the park behind the hotel Aquapark & Spa Žusterna, easily accessible by the path. There you can take advantage of the free internet, indoor and outdoor swimming pools, solarium, sauna and massage. The closest restaurants and other tourist facilities are a minute walk away, the beach around 100m. We can organize a pick up / drop off for our guests. Cleaning Fee is 35€ extra, paid upon arrival. Security deposit of 100€ is required upon arrival for incidentals. This deposit will be returned (less any damage incurred) upon check-out and after damage inspection of the accommodation. Slovenia is small country and it connects Central Europe to the Balkan and Mediterranean. I live with my family in the capital. From Ljubljana we need just 1 hour by car to come to all important parts of Slovenia: mountains, lakes, neighbouring countries, and Adriatic - to my sea apartment. It is a great base for daily exploring of Slovenia, Croatia and Italy. Slovenian Istria is a wonderful choice for holiday to Slovenia. Specially summer months are the best for swimming, sailing, diving, fishing or just relax and sunning. I spend free time with my family in our seaside apartment and we enjoy in Mediterranean garden the whole year. From October to May, there are very favorable conditions for relaxing and spending peaceful days at sea and enjoying the Mediterranean climate with its positive effect on well-being. The apartment is perfectly situated near the sea and close to the city center. In just a few steps you can get from a peaceful garden to the social life of the town or the beach. It is a great base for all of your adventures and exploring the area, and can be enjoyed throughout the year because of the pleasant Mediterranean climate. The Mediterranean Sea is ideal for swimming from June to October; the climate is pleasant throughout the year. From October to May, there are very favourable conditions for relaxing and spending peaceful days at sea and enjoying the Mediterranean climate with its positive effect on well-being. We can arrange a favorable price if you would wish to stay for a longer period. Welcome to our resort, enjoy it, use it and take care of the place like it is yours! Kitchen is equipped with cooker, dishwasher and refrigerator, basic utensils, dishes and tableware. privat quiet and fenced Mediterranean garden (40m²) with a summer kitchen and barbecue. In hotel Aquapark & Spa Žusterna you can take advantage of the free internet, indoor and outdoor swimming pools, solarium, sauna and massage. We stayed here for 5 days in Sept 2017. Great base for exploring the delights of Slovenia within a short drive - the Lipizzaners at Lipica, Predjame Castle and the marvellous Socjan Caves, as well as the local coastline. The new cycle and pedestrian track opened recently means you can easily walk into Koper or go a little further to Izola. The apartment is delightful - just as shown in the photos, but is also really private - the outside area is well enclosed and shielded by plants. We did miss the wi-fi a bit, but the short walk to the hotel to download the days news really wasn't a chore. Sonja was friendly and helpful and responded to any queries quickly. This apartment suited our needs perfectly. My son was playing at a tennis tournament in Bonifika. This is a 5 minute drive or a 15 minute walk away. We were able to self cater for breakfast and lunch and there is a nice pizzeria and a snack bar just a couple of minutes walk away where we had dinner most evenings. Wi fi is available from the hotel lobby which is part of the complex. It was very quiet and felt very safe. Sonja, the owner, was very nice and had a lot of helpful information for us. She responded immediately to our booking and she was very accommodating regarding our rather late arrival and our rather early departure. Simon and his son were great guests, polite and calm. They left apartment very clean and in order. I did not have any problems with them, and I would recommend both. I hope you enjoyed your stay, and you are welcome again here in the future! We had a great holidays at Sonja's place. Sonja is a very nice and helpful person. The dishwasher was broken and after some discussion with her we got a new one after a week. Koper is such a great place to stay. Koper itself is very nice and from there you can reach such other fantastic places and beaches. We rented 5 bikes, one with child's seat in Isola and enjoyed discovering the coast biking. We will definitely come back to Slovenia! Thanks Eva, I am glad you enjoyed your vacations. We also installed a new ceramic stove now and we will renovate the whole kitchen after the season. Herzlichen Dank für den freundlichen Empfang, wir haben uns sehr wohl gefühlt, vor allem die ruhige Lage, dennoch die Nähe zum Strand. Ist ein sehr schönes und freundliches Land. Kommen gerne wieder, sehr zu empfehlen. Thorsten, you have very nice family, thank you to were my guests and welcome again. les points positifs : parking privé, logement au calme, clim. Mais le prix peut paraître élevé d autant que tout est minimaliste. la wifi est en fait celle de l hôtel voisin et on ne peut pas la capter, porte de douche cassée, une seule plaque fonctionne sur les deux, séchoir a cheveux de poupée. The price includes the apartment and the privat equipped garden with kitchen as well. The description of the apartment does not include wifi and we do not promise it. Wir waren zum ersten Mal in Slowenien und haben uns wirklich sehr wohl in Koper gefühlt. Sonjas Apartment ist sehr gemütlich eingerichtet. Wir hatten nichts zu Beanstanden. The apartment is located in the park of a holiday resort, around 100m from the beach and the Aquapark & Spa Žusterna, on the coast between Koper and Izola. It is only 1 km (20 minutes walk by the seaside) to Koper city centre and 4 km to Izola city. The area around Žusterna has many beautiful places for families and people who love water sports (surfing, kite surfing, sailing, rowing...), and various beaches where you can enjoy the Adriatic Sea. It is a great base for daily exploring of Slovenia, Croatia and Italy. It is also a great starting point for cycling on the Parenzana track, which used to connect Trieste and Poreč and has now become a symbol of friendship between Slovenian, Italian and Croatian municipalities. Coastal cities Piran and Portorož are just 15 km away, the capital Ljubljana 100 km. It is around 20 km to Croatian border or Trieste. The closest airport is Trieste Ronchi (TRS), located about 65 km away. The closest ferry and railway station is in Koper, just 2 km from apartment. In Aquapark & Spa Žusterna you can take advantage of the internet, indoor and outdoor swimming pools, solarium, sauna and massage. The closest restaurants and other tourist facilities are a minute walk away, the beach around 100m. Cleaning Fee is 35€ extra, paid upon arrival. Security deposit of 100€ is required upon arrival for incidentals. This deposit will be returned (less any damage incurred) upon check-out and after damage inspection of the accommodation. Minimum stay is 3 nights. Rates are for the apartment with occupancy of up to 3 people. For any additional guests the charge is extra 11€-20 € per person per night. To confirm the booking 25% non-refundable deposit is required. When we receive the payment, the reservation is guaranteed. Key pick-up is with owner. We can arrange a favourable price for longer period, with a discount for stays longer than a week.